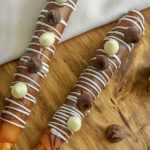 Chocolate Caramel Pretzel Rods are the perfect gift idea for the foodie or chocolate lover in your life! These pretzel rods combine two of the best candy flavors with the salty crunchiness of pretzels. These are sure to be a hit with your family and friends this holiday season! I love to give food gifts during the holiday season even more than that I love to receive them! 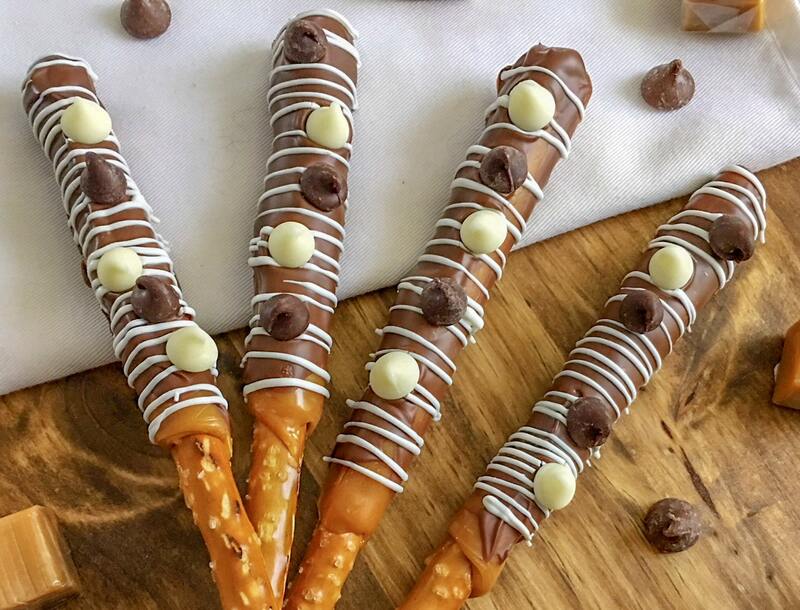 Nothing says love like a homemade treat and these Chocolate Caramel Pretzel Rods are the prefect way to say it!! Melt the chocolate and caramel in a tall microwave safe glass. Using a glass will make it easier to cover more of the pretzel with less mess than pouring or spreading the the chocolate and caramel. Begin by placing the unwrapped caramels in a microwave safe tall drinking glass and heat on 50% power for 1-2 minutes, stirring every 30 seconds until melted. Next, dip the pretzel about 3/4 of the way down into the melted caramel. Place dipped pretzel rods on a parchment paper lined pan and place them in the freezer for 15-20 minutes or until the caramel is hardened. Melt the chocolate chips in a microwave safe tall drinking glass and heat on 50% power for 3-4 minutes, stirring every 30 seconds until melted and pour into another tall glass. 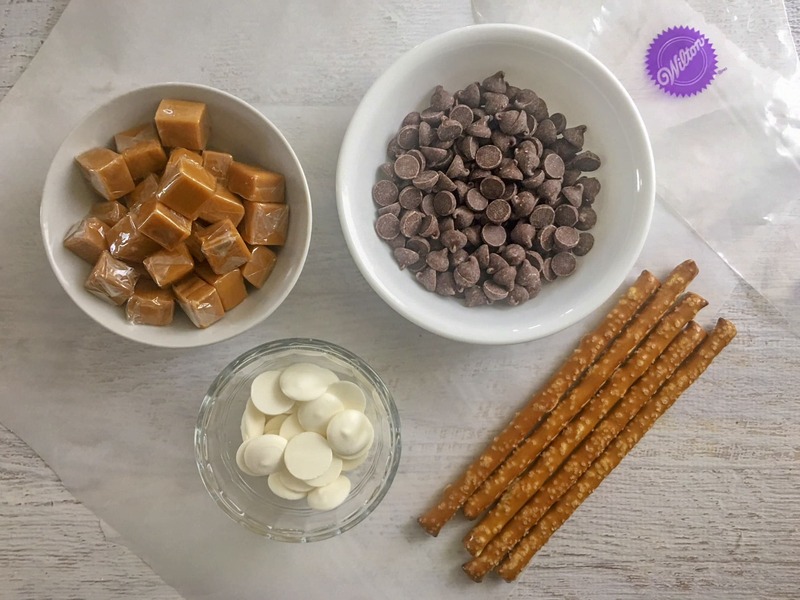 Dip the hardened caramel dipped pretzel rods 3/4 of the way into the melted chocolate chips allowing excess chocolate drip off then place onto a parchment paper lined plate or pan. Return the pretzels to the freezer for about 15-20 minutes or until the chocolate hardens. in a microwave safe bowl melt the candy whites on 50% power for 3-4 minutes, stirring every 30 seconds until melted. Pour the melted candies into a into a pipping bag and cut a tiny tip off the point of the bag. Once the chocolate is hardened remove the dipped pretzels from the freezer. Then using the pipping bag drizzle the melted white chocolate over the pretzels. Immediately press your milk and white chocolate chips onto the white chocolate while it is still soft. Finally, allow the pretzels to set for another 15 minutes or until the white chocolate has hardened. Not only are the pretzels delicious they are fun and festive! 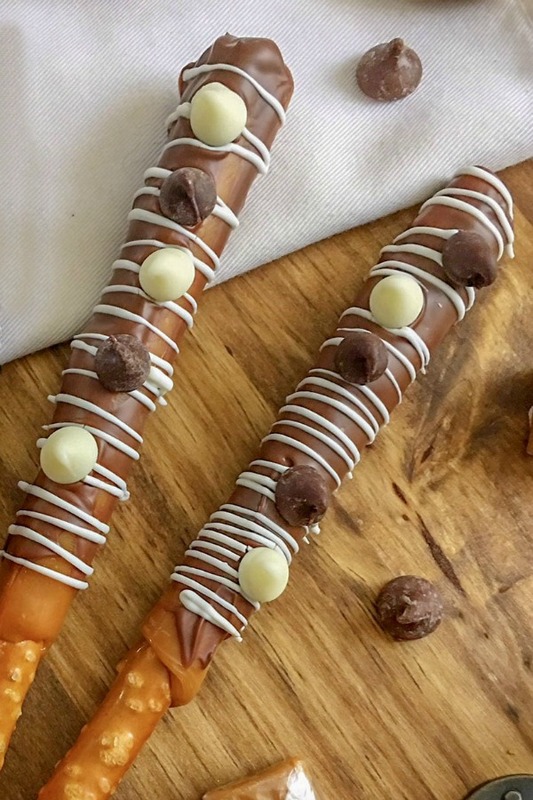 So if you are looking for a last minute or super simple treat to give to neighbors or co-workers these Chocolate Caramel Pretzel Rods are perfect! Looking for more fun snacks for gifting or snaking during the holidays? Place the unwrapped caramel in a microwave safe tall glass and heat on 50% power for 1-2 minutes, stirring every 30 seconds until melted. Dunk 3/4 of the the pretzel rod into the melted caramel and place on a parchment paper lined paper plate or pan and place them in the freezer for 15 minutes. Melt chocolate chips in a microwave safe bowl and heat on 50% power for 3-4 minutes, stirring every 30 seconds until melted and pour into another tall glass. Dunk caramel covered pretzel rod 3/4 of the way into the melted chocolate. Allow any excess chocolate drip off and place onto a parchment paper lined plate or pan. Place the dipped pretzels to the freezer for about 15-20 minutes to harden. Melt the white candy melts in a microwave safe bowl and heat on 50% power for 3-4 minutes, stirring every 30 seconds until melted and pour into a pipping bag and cut a tiny tip off the point of the bag. Remove the pretzels from the freezer and drizzle the white chocolate over the chocolate covered pretzels. Immediately press the milk and white chocolate chips onto the white chocolate while it is still soft allowing them to adhere to the pretzel rod. Allow them to set for another 15 minutes or until the white chocolate has hardened.